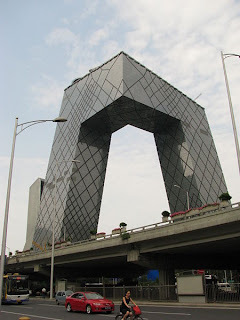 The CCTV Headquarters is a skyscraper in the Beijing Central Business District. 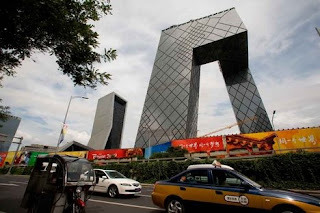 The building is the headquarters of China Central Television. Groundbreaking took place on September 22, 2004 and the building was completed in December 2008. The main building is not a traditional tower, but a continuous loop of six horizontal and vertical sections covering 4.1E+6 square feet (381,000 m2) of floor space, creating an irregular grid on the building’s facade with an open center. 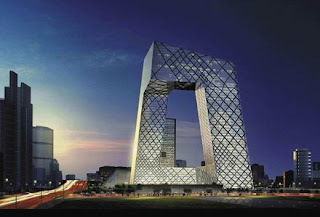 The construction of the building is considered to be a structural challenge, especially because it is in a seismic zone. The building was built in two sections that were joined to complete the loop on December 26, 2007. In order not to lock in structural differentials this connection was planned to be completed at the coldest time of night when the steel in the two towers cooled to the same temperature. 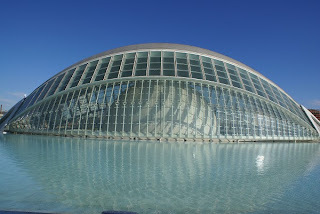 El Palau de les Arts Reina Sofía (Queen Sofia Palace of the Arts) is an opera house and cultural centre in Valencia, Spain. The theatre opened on 8 October 2005. 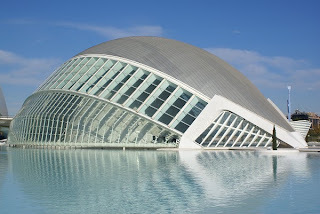 It is the last-completed part of a grand 'City of Arts and Sciences'. The Sala Principal (Main Hall), which seats 1,700 people, functions primarily for opera, but it can be converted for dance and other performing arts. The Hall has 4 tiers of seating, a stage equipped with all major facilities and an orchestra pit capable of housing 120 musicians, the third largest in the world. 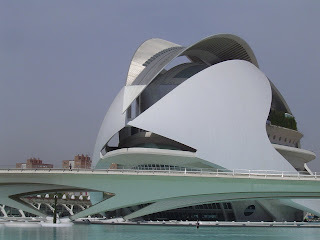 L’Hemisfèric, the distinctive eye-shaped construction, was the first element to be opened to the public in the "City of Arts and Sciences", in April 1998. 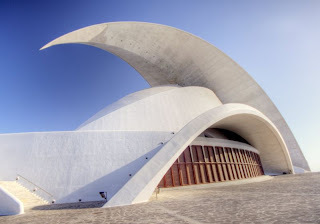 The building’s unique architecture comes alive as the lids of the colossal “Eye of Knowledge” opens up to reveal the fascinating setting. 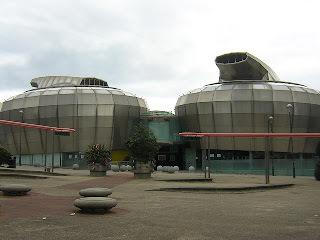 The globe of L’Hemisfèric (the Planetarium), which also houses the Omnimax theater, is roofed over by an elliptical shell structure and placed within an elliptical pod that cradles it like the pupil of an eye. 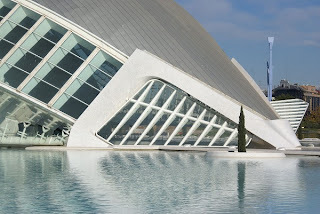 The concrete socket of the eye incorporates elongated aluminium awnings that differ in length and fold upwards collectively, or as individual units, to form a brise-soleil roof that opens along the curved central axis of the eye shape. The concrete encasement has been extended upwards, and the brise-soleil narrowed and replaced by a system of slats mounted on each side of pivoting, to imitate the structure of a feather. 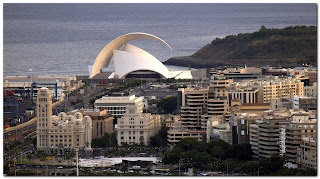 It is located on Avenue of the Constitution of the capital, Santa Cruz de Tenerife (Canary Islands), Spain. Its construction began in 1997 and ended in 2003. 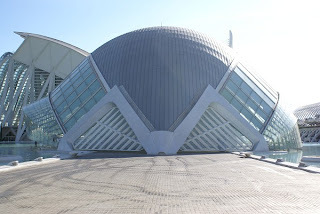 The building has an organic and very famous structure in the shape of 'sails' with white blue rollers. The auditorium has a big room for concerts, a room for opera and other smaller rooms. It is an emblem of the city and is one of the more photographed buildings. The building stands on the plot of 23000 square meters of which the auditorium occupies the 6471 square meters, divided in two chambers. On the outside has two terraces overlooking two places from which you can see the sea. 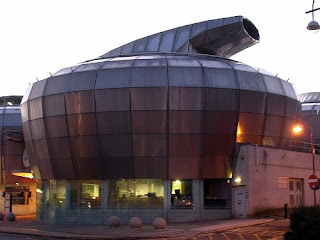 The National Centre for Popular Music was a museum in Sheffield, England for contemporary music and culture, a £15 million project, which opened on 1 March 1999, and closed in June 2000. The building consists of four giant stainless steel drums, surrounding an atrium area, the upper floor of which has a glazed roof. The drums, whose tops were built to rotate in to the wind, no longer rotate and have been left pointing in various directions. The ground floor contained office space, a shop, a bar, a cafe and a further exhibition space. Access to this floor was free, with only the top floor forming the museum. 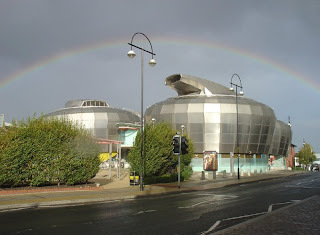 It became a live music venue for a period from July 2001 and then being taken over by Sheffield Hallam University from September 2003, who bought it from Yorkshire Forward for £1.85m in February 2003. 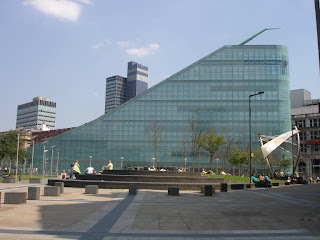 Urbis is an exhibition centre located in central Manchester, England. The centre features changing exhibitions on the subject of city life, alongside talks, gigs and other events. 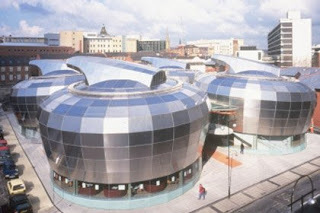 The building opened in 2002 as part of the redevelopment of the area around Exchange Square known as the Millennium Quarter. 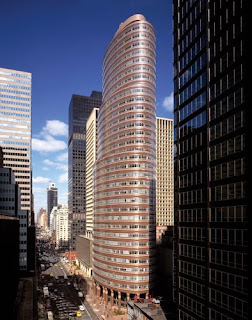 The design and shape of the building can be compared with the Flatiron Building in New York. The exhibition centre is set across five floors. Hosting temporary exhibitions that run from between three to five months. 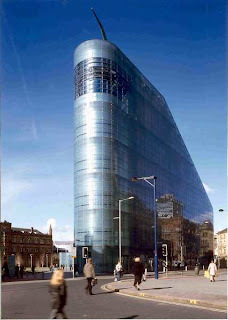 Each October, the entire building is given over to Manchester Fashion Weekend, an offshoot of a similar event in London. 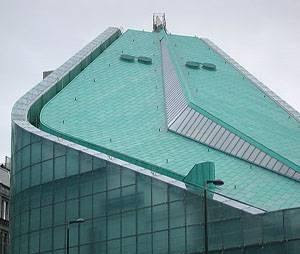 Urbis also contains a cafe, a shop, rooms for corporate hire and a restaurant and bar, on the fifth and sixth floors. 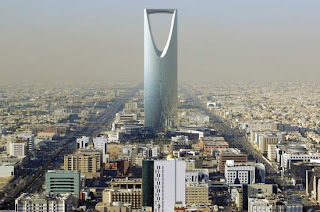 Kingdom Centre also called Burj Al-Mamlaka is a supertall skyscraper located in the city of Riyadh, Saudi Arabia. 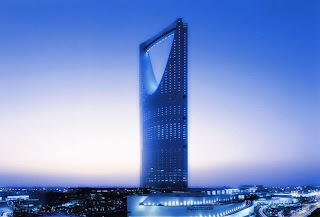 It is the tallest skyscraper in Saudi Arabia and the 45th tallest building in world with a height of 311 m (1,020 ft). It is also host to the highest mosque in the world. 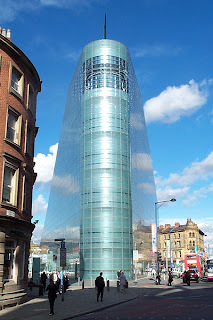 The Tower Contains a total of 43 floors including the basement levels. The Kingdom Centre is owned by a Prince of the Saudi Royal Family. It is also the headquarters of his holding company: Kingdom Holding Company. The total cost of the project was US$1 billion. 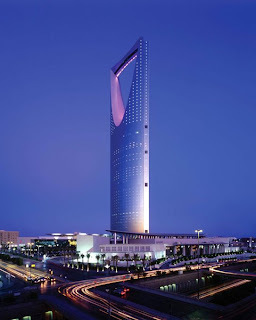 Kingdom Centre was the winner of the 2002 Emporis Skyscraper Award, selected as the "Best skyscraper of the world for design". A five-level shopping center, which also won a major design award, fills the east wing. The large opening is illuminated at night in continuously changing colors. 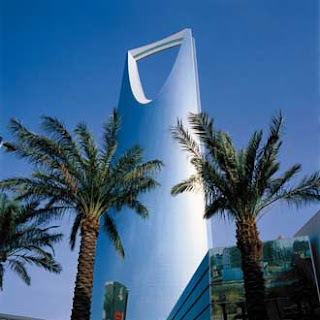 Besides the shopping mall, the Centre includes the Four Seasons Hotel Riyadh and state-of-the-art apartments. 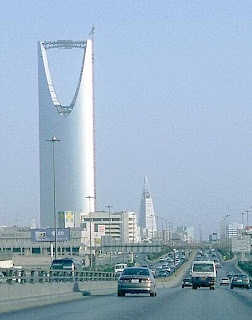 The 100 meter long skybridge atop the skyscraper, at a height of 311 meters, contains a public observation deck and a view of the entire city of Riyadh. The ellipse motif taken from the tower's footprint appears also in the light fixtures, ceiling panels, entrance canopy, wastebins, and furniture. 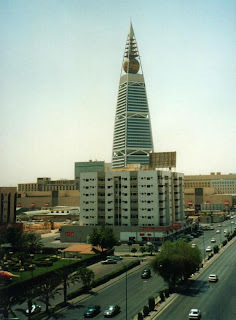 Kingdom centre is in direct axis with Riyadh's other skyscraper the Al Faisaliyah Center. It creates a silhouetted skyline in the evening. 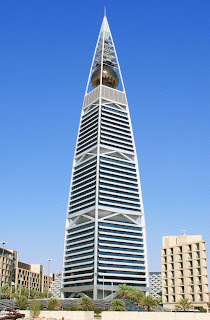 The Al Faisaliyah Center is a commercial skyscraper located in the business district of Riyadh, Saudi Arabia. 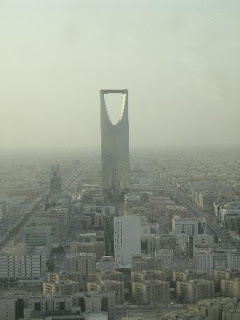 It is the second tallest building in Saudi Arabia. Immediately below it an outside viewing deck; at ground level, there is a shopping center. 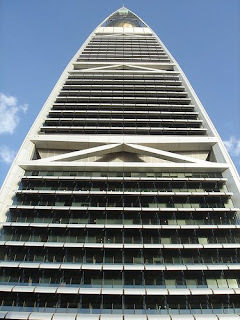 The Al Faisaliyah Center is about 267 meters high and consists of 44 floors. 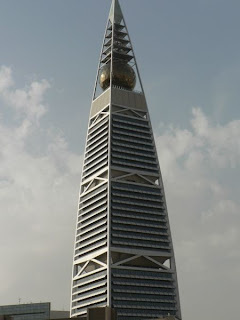 The 4 corner beams of the al faisaliyah centre join at the top above a golden ball. The design is said to be based on that of a ballpoint pen. 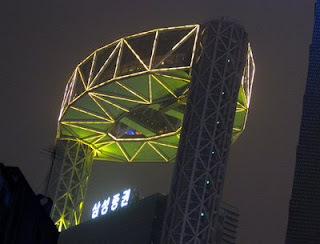 Inside the golden ball is a luxury revolving restaurant. 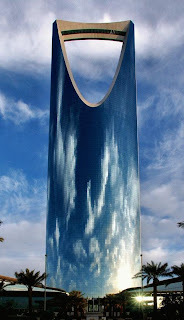 There is a clear view of Saudi Arabia's other skyscraper, the Kingdom Centre, from the Al Faisaliyah Center and the two buildings create a silhouetted skyline in the evening. 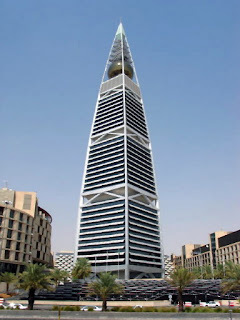 It is part of an Al Faisaliyah Complex, which consists of a hotel, the tower, and two other buildings. 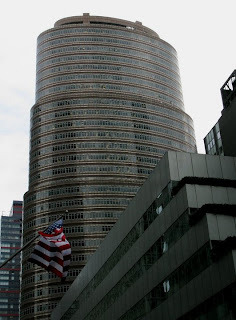 The Lipstick Building (also known as 53rd at Third) is a 453 foot (138 meters) tall skyscraper located at 885 Third Avenue, between East 53rd Street and 54th Street, across from the Citigroup Center in Manhattan, New York City, United States. It was completed in 1986 and has 34 floors. At three levels, blocks of the building recede as part of a building regulation in which the building is required to recede at least three times to increase the availability of light to street level. 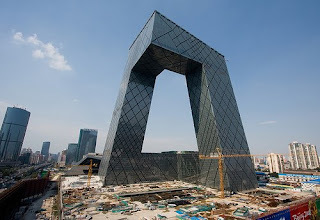 The shape, which is unusual in comparison to surrounding buildings, uses less space at the base than a regular skyscraper of quadrilateral footprint would use. This provides more room for the high numbers of pedestrians who travel via Third Avenue. At the base, the building stands on columns which act as an entrance for a vast post-modern hall. They are two stories high and separate the street from the nine meter high lobby. Because the elevators and emergency staircases are located to the rear of the building, this area is "hollow". 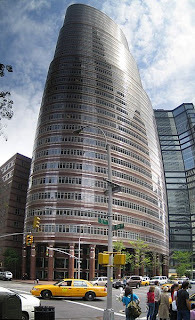 The exterior of the building is a continuous wall of red enameled Imperial granite and steel. The ribbon windows are surrounded by gray frames. In between each floor is a small line of red which is taken from the red color of lipstick. 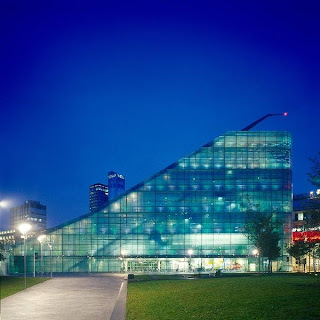 The curvature of the building allows light to reflect off the surface at different places. 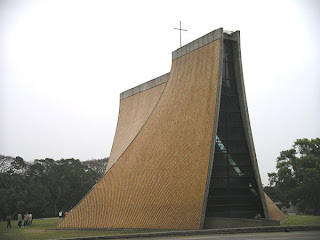 The Luce Memorial Chapel is a Christian chapel on the campus of Tunghai University, Taichung, Taiwan. The project was originally planned in April 1954 but put on hold until July 1960. Construction took place from September 1962 until November 1963. Construction costs were USD $125,000. 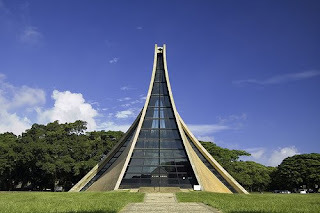 The chapel occupies a 12,000 square metre site on campus and is set on an irregular hexagonal base, providing 477 m² of gross floor area, including a 245 m² nave (500 seats), 81 m² chancel, and 44 m² robing rooms. 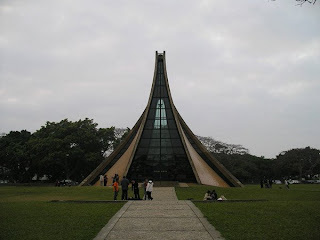 The church itself is a curved, tent-like structure rising as a hyperbolic paraboloid to 19.2 m high and establishing a central focal landmark on the campus. 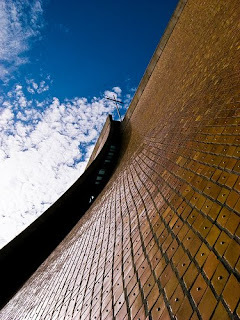 The chapel was executed in reinforced concrete with its form providing earthquake stability. Construction involved elaborate formwork by local craftsmen. Ribs reinforce the curved surfaces and thicken as they descend, preventing buckling while expressing structural forces. 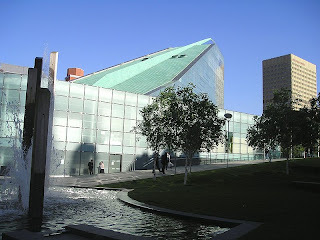 The exterior is covered by glazed diamond-shaped tiles, and on the interior, thicker diamond-shaped concrete coffers at the bottom gradually diminish in size as they near the top since stresses are concentrated near the ground. 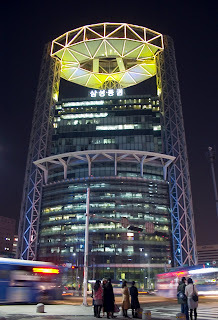 Jongno Tower is located in Jongno(Bell Street) area in central Seoul, South Korea. 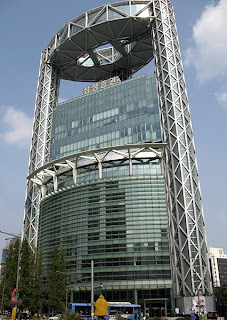 Jongno Tower is a 33-story office building. 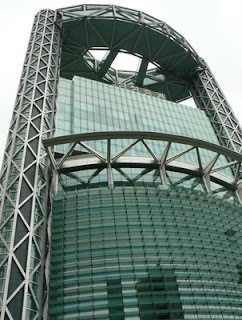 Its top floor is equipped with a restaurant and bar which is famous for its view of Jongno and other areas of Seoul. The tower's distinctive enclosure, which features exposed steel girders and large scale aluminum louvers, is noteworthy for an innovative structural glass curtain wall system. The steel-bezel technique for joining sheets of glass makes possible a transparent facade whose weight is carried by vertical glass blades reinforced only by delicate stainless steel rods. 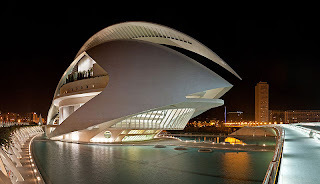 All the pictures and works of architecture found in this blog are copyrighted to their respective owners, and are featured here for information purposes only.